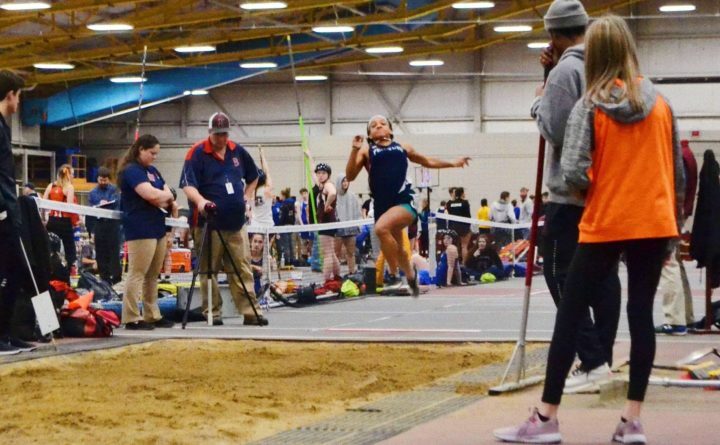 Cymeria Robshaw of Penquis Valley High School soars toward the pit while competing in the triple jump at the Class B indoor track and field state championships held in February at Bates College in Lewiston. Robshaw is a PVC/EMITL all-conference selection. 55m dash: Naomi Noack, Bangor; 55m Hurdles, 200m: Morgan Honey, Brewer; 400m dash: Mackenzie Lambert, Bangor; 800m run: Eliza Parker, Hampden; 1 mile run & 2 mile run: Helen Shearer: Hampden Academy; High Jump: Sophie Inman, Bangor; Pole Vault: Sofia Wittmann, Bangor; Long Jump & Triple Jump: Alyssa Elliott, Bangor; Shot Put: Emma Hargreaves, Old Town. 55m dash & 200 m dash: Marilynn Sawyer, MDI; 400m dash: Eliza Parker, Hampden Academy; 800m run: Zoe Olson, MDI; 1 mile run: Olivia Mosca, Brewer; 2 mile run: Lydia Gilmore, Bangor ; 55m Hurdles: Georgina LaGrange, John Bapst; High Jump: Grace Sanborn, Old Town; Pole Vault: Kaitlyn Helfen, Brewer; Triple Jump & Long Jump: Morgan Honey, Brewer; Shot Put: Camden Lavoie, Bangor. 55m dash & Triple Jump: Cymeria Robshaw, Penquis; 200m dash, 400m dash & Long Jump: Camille Kohtala, Orono; 800m & 1 mile run: Eleanor Tyne, Orono; 2 mile run: Lauren Morrison, Mattanawcook Academy; 55m Hurdles: Grace Broughton, GSA; High Jump: Emma McKechnie, Ellsworth; Pole Vault: Maggie Coutts, Orono; Shot Put: Jayden Love, Orono. 55m dash: Camille Kohtala, Orono; 200m dash: Grace Broughton, GSA; 400m dash: Addie Morrison, Bucksport; 800m run: Jaeden Viani, Central; 1 mile run: Lauren Morrison, MA; 2 mile run: Josie Czuj, GSA; 55m Hurdles & Triple Jump: Maggie Coutts, Orono; High Jump: Ivy Manner Wheeldon, GSA; Pole Vault: Eleanor Tyne, Orono; Long Jump: Cymeria Robshaw, Penquis; Shot Put: Abby Call, Central. 55m dash: Landyn Francis, Bangor; 200m dash: Andrew Munroe, Bangor; 400m dash, 800m run & 1 mile run: Wyatt Lord, Hampden; 2 mile run: Jason Mathies, Hampden; 55m hurdles, High Jump, Long Jump, & Triple Jump: Zachary Beaton, Hermon; Pole Vault: Elijah Denning, MDI; Shot Put: Ryker Brown, Bangor. 55m dash, 200m dash & Long Jump: Liang-Kang Lin, Old Town; 200m dash: Zachary Beaton, Hermon; 400m dash: Landyn Francis, Bangor; 800m run, 1mile run: Jason Mathies, Hampden; 2 mile run: Wyatt Lord, Hampden; 55m Hurdles: Andrew Munroe, Bangor; High Jump: Cole Jordan, Bangor; Pole Vault: Joshua Hart, Brewer; Triple Jump: Wade Brown, Hampden; Shot Put: Gilbert Isaacs, MDI. 55m dash & 200m dash: Carter Tolmasoff, Bucksport; 400m dash: Nathaniel Sawyer, Bucksport; 800m run: Meredith Bradshaw Thomas, GSA; 1 mile run: Patrick Tyne, Orono; 2 mile run: Matt Shea, Ellsworth; 55m hurdles: Henry Scheff, Ellsworth; High Jump: Nate Mason, Ellsworth; Pole Vault: Aaron Bard, Bangor Christian; Long Jump & Triple Jump: Cayden Spencer Thompson, MA; Shot Put: Luke Preble, Central. 55m dash: Trenton Ellis, Orono; 200m dash: Ian Renwick, GSA; 400m dash: Jack Miller, Central; 800m run: Liam Velgouse, Central; 1 mile run: Matt Shea, Ellsworth; 2 mile run: Nicholas Cormier, Ellsworth; 55m Hurdles & Pole Vault: Niklas Dittmar, Orono; High Jump: Henry Scheff, Ellsworth; Long Jump & Triple Jump: Nate Mason, Ellsworth; Shot Put: Logan Grass, Ellsworth.